To be honest, I’d heart about Diaper Genie’s for quite some time leading up to my pregnancy but questioned whether or not it truly was a necessity. Fast-forward to when it came time to organizing my baby shower registry prior to welcoming my little boy last summer – and I neglected to add a Diaper Genie to my list. Since then though there have admittedly been plenty of times where in I’ve cursed the fact that I chose to forego this neat little contraption as I’ve made trip after trip down to the garbage room in our building (oftentimes at rather inconvenient hours to boot!). 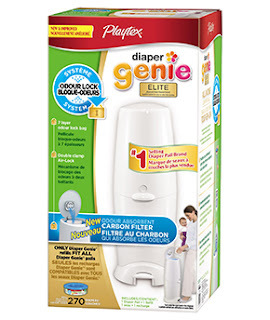 So, you can imagine how absolutely thrilled I was when asked to put the new Playtex® Diaper Genie® Elite with Carbon Filter to the test a few weeks ago. The trial couldn’t have come at a better time with my now 9 month-old having transitioned to eating semi-solid foods…and with that transition comes a whole new level of diaper stink. First off, the Diaper Genie comes with easy-to-follow assembly instructions and very few parts to worry about (not to mention a nice box that is guaranteed to keep your little one happily amused for at least 30 minutes). Once assembled and neatly tucked away next to the change table the slim silhouette of the Diaper Genie all but disappeared in my condo-sized bedroom – as did the scent of smelly diapers thanks to an added odor neutralizing charcoal filter. The Elite is slightly taller than other Diaper Genie models (great given I am tall), and it features a convenient foot-pedal that activates the lid, allowing you to quickly get rid of soiled diapers in a snap. We managed to fit close to a weeks worth of diapers in our Elite Diaper Genie before I had to empty it, and even that was a cinch. A push button pops open the plastic cover allowing for easy access to the bag with minimal exposure to odor. A quick snip, knot and repositioning has the Elite Diaper Genie back in business in minutes! We’ve yet to cycle through the package of Diaper Genie Disposable System Refills that was included with the product itself, so I can’t truly attest to how having to replace them on the regular will become a factor in my level of adoration for this handy system (and how long we continue to use the Diaper Genie as a result). I did reach out to a few other Mom’s using the Diaper Genie system to hear what their thoughts were on the maintenance matter and it was pretty clear that the only main complaint was the costliness of the refills. Apparently you can keep an eye out for the odd sale and there several tips listed out there offering up no name brand tricks to help you avoid the costly refills. Given that the Elite system also calls for the periodic replacement of its carbon filter (that helps to contain smells), I would also factor that into matters if contemplating a purchase – but even then, a quick look online reveals that they are available at a reasonable price. These two minor points aside I would still give this product a green light and simply wish I’d had one sooner. For more information about Playtex® Diaper Genie® Elite with Carbon Filter or other Diaper Genie® products and accessories visit: www.playtexbaby.ca. Enter to win your very own Diaper Genie at www.urbanbaby.ca in the contest section. Good Luck! Danica keeps herself busy as a solo-mom to a busy baby boy while running her own business and living coastal life to the fullest! She enjoys an active lifestyle (when not busy working on exciting projects or taking her tiny tot out on adventures). See what she's up to at: www.dvinewrites.com.